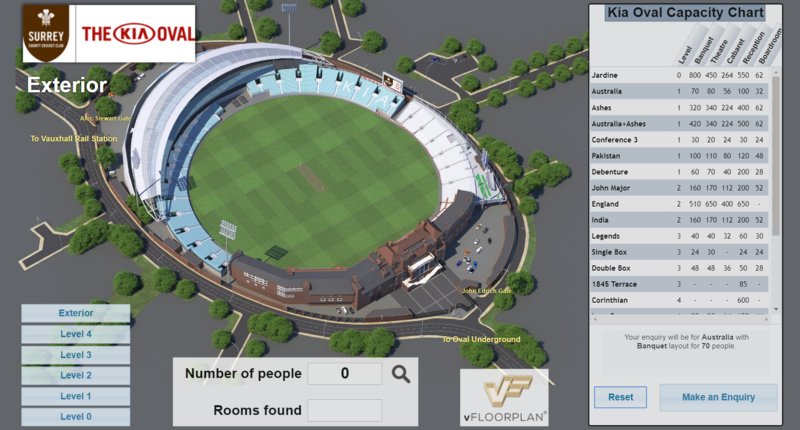 The impressive and iconic KIA Oval, home to Surrey County Cricket Club has invested in a vFloorplan 3D version 4 to showcase their versatile meeting spaces within a 3D representation of all their stands and main pavilion buildings and showing their cricket pitch and surrounding features. Now instead of using flat non interactive documents and images of floorplans and capacity chart numbers, their new website shows off all their spaces in a stunningly exciting and colourful searchable floorplan and capacity chart numbers. No venue is too big, or too small for vFloorplan and The KIA Oval also shows their pitch and is instantly recognisable on their website. Meeting bookers and coporates can search for the right space for their event and make a detailed enquiry directly to the sales team, and bringing their venue to life on their website.